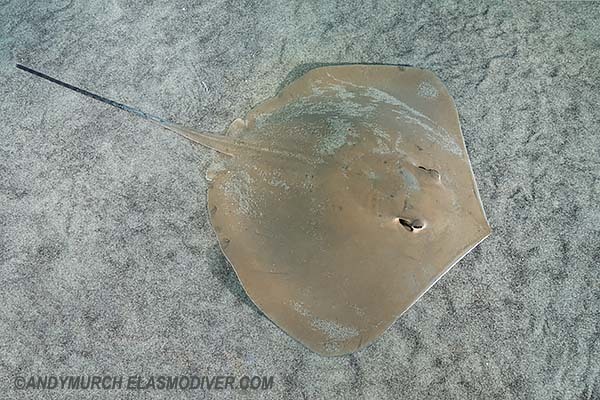 Common Names: Arabian Banded Whipray, Randall's Stingray or Arabian stingray. Identification: Weakly rhomboidal disc, slightly wider than long. Anterior margins obtuse and slightly concave. Snout pointed. Posterior disc margins convex. Rounded free tips. Dorsum uniformly greenish-tan to greenish-grey, unspotted. 1 to 2 small, oval or heart-shaped mid-shoulder denticles. Ventrum white. Long whiplike tail 1.8-2.4 times disc width. Tail tapering without fin-folds. Tail banded in juveniles, fading in adulthood. Usually 1 large denticle covered stinging spine. Filamental rear section of tail beyond spine, dark or black. Size: Maximum disc width at least 62cm. Habitat: Found mostly on sand and mud substrates (sometimes adjacent to reefs) down to 60m. Distribution: Indian Ocean. Apparently restricted to the ArabianGulf/Persian Gulf. Diet: The Arabian banded whipray mostly feeds on shrimps. Reproduction: Ovoviviparous. Litter size unknown. Conservation Status: The IUCN lists the Arabian Banded Whipray as LEAST CONCERN. The population is presently stable but habitat destruction may lead to an eventual reduction. The main threat to this species is incidental capture in trawl and gillnet fisheries. Marine habitats in the Gulf are experiencing high levels of disturbance and quickly deteriorating due to major impacts from development activities (including dredging and reclamation), desalination plants, industrial activities, habitat destruction through the removal of shallow productive areas and major shipping lanes (Sheppard et al. 2010) which is likely to impact this species. Photographs: Dubai, United Arab Emirates. Similar species: Maculabatis randalli shares its range with a number of other dasyatid stingrays, most of which can be differentiated by their disc shape or the presence of fin-folds on their tails. Other undescribed, plain coloured maculabatis rays may be present in the Indian Ocean. Reaction to divers: Skittish. Will bolt if closely approached. Diving Logistics: This ray is seen by divers in the UAE. Dive shops in Abu Dhabi run to sites where this ray is occasionally encountered. Dulvy, N.K., Bineesh, K.K., Grandcourt, E., Al Mamari, T. & Moore, A. 2017. Maculabatis randalli. The IUCN Red List of Threatened Species 2017: e.T47407786A109921879. http://dx.doi.org/10.2305/IUCN.UK.2017-2.RLTS.T47407786A109921879.en. Downloaded on 20 October 2017.